Guide and information of Japan travel, with Tokyo Islands, Oshima Ohshima Island. This one is located between Pacific Ocean and East China Sea, south of Kagoshima, north of Okinawa, some 1,300km away from Tokyo. There were only JAL used to fly there, but now LCC called Vanilla Air is giving us chance to visit the island cost affective! Great view of Mt.Fuji will be captured on right window from Narita to Amami Oshima. Great view of Mt.Fuji will be captured on left window from Amami Oshima to Narita. Therefore, it is worth paying extra few hundred yen to assign certain seat/s. Actually highly recommend to pay, and worth to do so to get the Relax Seat. And here is some tip to make your journey as wonderful as you expect. 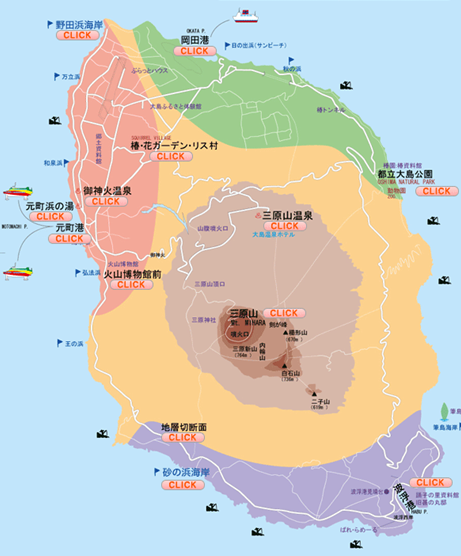 Unlike Miyakejima (Miyake island), Oshima or Ohshima island does not require gas mask to visit, but it is true that almost every 35 - 40 years there has been a volcanic activity, the last one which caused a month whole island evacuation was in 1986. You might have asked yourself "where is the RINGU (RING) island in Japan? ", well the answer is here! The island is creepy famous for the horror movie. Now even available on 3D effect, how creepy is that if Sadako san lives in virtual reality!? Ohshima Park Zoo (free of charge) is located in north east of island. There is a coastal hiking route along the cliff and rough sea. Bus between Okata port (not Okada in pronunciation) and the park zoo is 14 minutes, 370yen, or about 2 hours wild (nice) walk. Bird cage is fun to be inside to feel like you are in the bird nature. Male camel was born in 1996 Hiroshima, exchanged to Fukuoka, traveled 800km to this island in 2008. Are you a fun of onsen (hot spring)? No wonder the island is in high magma activity, there are many onsen hot spot. Below introduces some of them. Oshima Onsen is right next to the crater cone area. You may even stay over-night from where you can capture sunrise and sunset beautifully. Hamanoyu is right next to the Pacific Ocean, only 4 minutes short walk distance from Motomachi port. It is mixed onsen (male and female in the same bath). Unlike other hot spring, swimming suit (swimming pants) is must, so if you are shy but wanted to shout in front of the wild sea, this is the ideal place. Kurumiya gained the benefit of the eruption in 1986, their cold well suddenly became hot natural spring, you will enjoy this Japanese style ryokan (20 rooms only). Gojinka Onsen has no outside spa but 25m swimming pool (of course filled with hot natural spring). Bring your swimming suite and cap, and why not exercise in onsen pool? It is located actually right next to Hamanoyu (outside onsen, rotenburo), combination ticket has discount.